Peyton Manning was considered to be one of the best quarterbacks in the NFL. But then he retired and since then, he’s kept a fairly low profile. But it turns out that we may, in fact, know what Manning’s next career move will be: a foray into politics. Senate Foreign Relations Chairman Bob Corker announced Tuesday that he was retiring after just two terms, throwing Republicans into turmoil. Corker had spoken with Donald Trump on Tuesday, who had encouraged him to run again. While many knew that he was considering stepping down, most Republicans still believed he would go for one more term. Some thought that Steve Bannon was preparing to mount a primary challenge against him, but Corker insisted that he wasn’t intimidated. “When we knew we had the support of the president, that didn’t really matter,” he said. Democrats are already hoping they will be able to take Corker’s seat, but if Peyton Manning does, indeed, run for the seat, they will have quite the challenge on their hands. A source said that the GOP saw Manning as a viable candidate for the seat, along with Representative Marsha Blackburn, and Governor Bill Haslam. 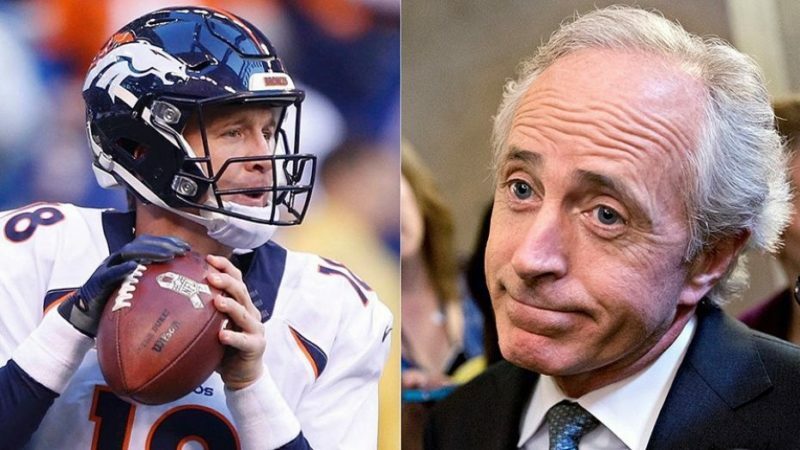 Representative Scott DesJarlais also suggested that Manning could be a possibility, but not until 2020, and only if Lamar Alexander decides to step down. If Peyton Manning ran for office, would you vote for him?